THE CANADIAN AMBASSADOR to Ireland Kevin Vickers has spoken about his experience of stopping a terrorist attack. This happened in October 2014, when a lone gunman stormed the Canadian parliament building. Michael Zehaf-Bibeau, a 25-year-old Muslim convert, shot and killed Canadian soldier Corporal Nathan Cirillo on the steps of the parliament before attempting to enter the main building. Speaking this morning on RTÉ’s Marian Finucane show Vickers described the incident and said that there was “no glory” in what he did. Regrettably that young man is no longer with us. “You know later that night I woke up at 5.30am in the morning and I was crying,” he went on. Part of Vickers’ duties as Sergeant-at-Arms of the Canadian parliament had been to carry in the ceremonial mace into the chamber at the start of the day’s business. Returning to work the day after the incident, he received a standing ovation from parliamentarians that went on for several minutes. During the interview Vickers then went on to give an emotional account of how his mother helped him recover from the incident. At her prompting, he gathered the local priest and members of his family at his family home in Chatham, New Brunswick. He said that together they prayed for the mother of Corporal Nathan Cirillo, the mother of Michael Zehaf-Bibeau, and then also for Zehaf-Bibeau. You know I thought the first person Christ let into the kingdom of heaven was the person crucified next to him. So I said a prayer for the man that I shot. So it just kinda, as they say, put you back onto the ground. 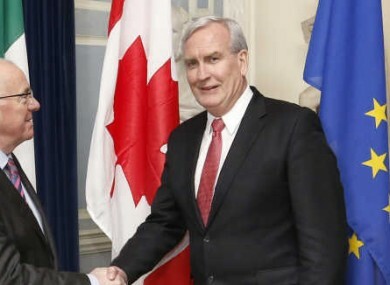 He has been the Canadian Ambassador to Ireland since January last year and has strong Irish heritage, with his ancestors having left either Wicklow or Laois. Email “'There's no glory in taking a man's life': Canadian ambassador to Ireland on stopping a terrorist attack”. Feedback on “'There's no glory in taking a man's life': Canadian ambassador to Ireland on stopping a terrorist attack”.